In university I lived in a shared flat and, more than anything, my roommates and I loved to invite friends over. From casual movie nights and birthday parties to cozy Sunday dinners, we tried hard to make just about everything an occasion. 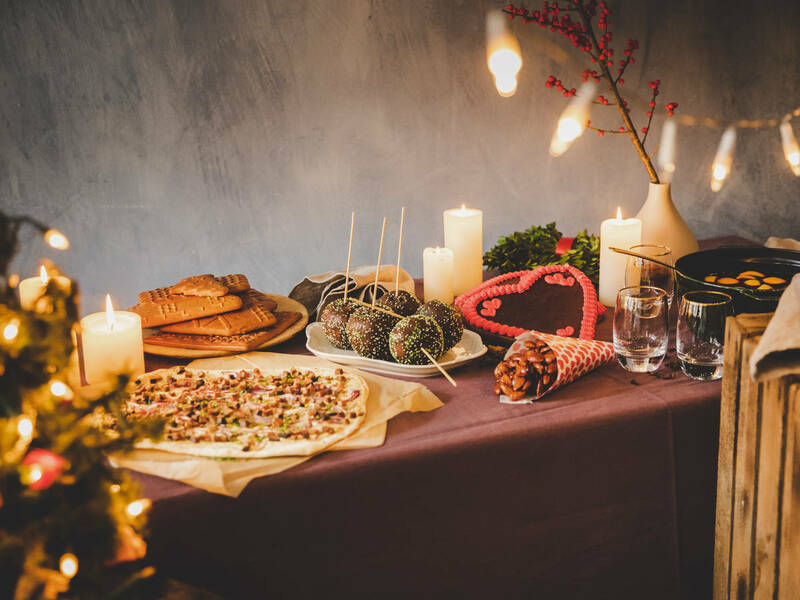 There's one party I still remember quite vividly—where we imitated a classic European Christmas market at home—and in just a few simple steps, you too can turn your kitchen (or even the whole apartment!) into a DIY Christmas market. Just follow our 7 step checklist and you're good to go! Let's start with the basic setting: Since the typical European Christmas market takes place outside—in the blustery winter air, it's not the real deal if you're not just a bit cold. Clinging to a cup of mulled wine to keep your hands warm is a crucial part of every market atmosphere (and it even saves heating for the evening). Okay, jokes aside, of course it's not a must to open the windows, but I have to say that it was a definite upgrade to our own party back in university. To see all our friends walking around our apartment in coats and caps was priceless and truly helped bring the theme to life. Whether you've been to a European Christmas market or not, just one look at a few photos and you'll see it's all over the place when it comes to decorations, so follow in those footsteps and go with the flow. Light some candles and if it hasn't snowed yet, some artificial snow can do the trick. From Christmas tree decorations to fir branches and traditional German wooden crafts (like an cute little incense smoker) you can, and should, do everything you can to recreate that festive atmosphere. Having checked off the basics, let's take a look at the heroes of our evening: All things sweet! It's won't feel like a real Christmas market without chocolate covered apples or candied almonds, so don't even think about skipping these. Depending on the possibility to buy some of the sweet snacks in a store nearby it might takes even less time, but doing them yourself is always more fun. Send some recipes to your friends so everybody can bring something to the party, this way, you can all share the experience and best recipes, and nobody will be left feeling overwhelmed. Basically, you can serve any cookie from the Christmas bakery that you like, but there are some essential Christmas market classics you shouldn't miss! Preparing chocolate apples is pretty easy: Press a wooden skewer into each apple and dip them into melted chocolate (depending on your taste, you can use dark, milk, or white chocolate). Here's an extra tip: It works best if you transfer the molten chocolate into a liquid measuring cup that just fits the apple. After covering it with chocolate, garnish the apples with sugar sprinkles, chopped nuts, or coconut flakes and let them dry on a parchment lined baking sheet. Decorating them with paper straws and a bow gives them a perfect party finish. If apples aren't your thing, you can cover just about any other kind of fruit you like, such as bananas, grapes, kiwis, mandarins, or even dried fruits. Candied almonds can even be served warm to your guests for an added cozy bonus. To avoid burning the almonds, you always need to keep an eye on the pan or pot, but the preparation isn't complicated. After heating up a light sugar syrup with seasonal spices, add the almonds (or other nuts of your choice) and let them caramelize. Still not enough sweets? Here are more recipes for homemade classic speculaas cookies and deep fried dough bites. In addition to prepared sweet snacks that you can munch on in passing, it's always nice to have the opportunity to get creative. Decorating gingerbread hearts is definitely not only fun for the kids—trust us, we had a ton of fun doing it for this article! Bake the basic hearts 1 – 2 days in advance and prepare the icing right before the party begins. Beat egg whites and confectioner's sugar into a shiny, thick icing. Dye the icing with colors of your choice and fill several piping bags that your guest can start decorating with! If gingerbread hearts aren't enough for you, go the extra mile and prepare a gingerbread house! The method is the same, but instead of cutting out hearts, you can prepare the different walls and items to build a house. Our recipe doesn't only show you how to do it, but also features a helpful template for this DIY Christmas baking project. Looking for a mulled wine alternative? Let's go for a Hot Toddy then, an English hot whiskey, or a cranberry cider. If you're looking for alcohol-free drinks, may we suggest butterbeer, London fog, chai hot chocolate or a classic hot chocolate with whipped cream? In addition to numerous Christmas playlists and Mariah Carey in an endless loop, you can ask your guests in advance to tell you their favorite Christmas songs. This personalized mixtape will be the best playlist for your Christmas market and everyone can share their childhood favorites and swap stories. Have you ever been to a Christmas market? What was your favorite thing about it? Share with us in the comments!